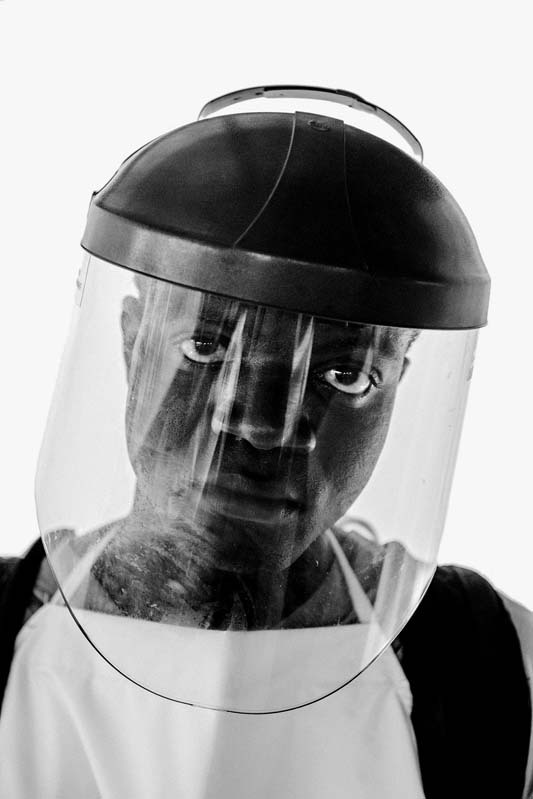 SUAKOKO, LIBERIA - OCTOBER 18, 2014: Moses Tarkulah, 29, from Sinyear, a hygienist and sprayer, stands for a portrait at the Bong County Ebola Treatment centre on October 18, 2014 in Bong County, Liberia. "When I come into work, I pray to the almighty God that I should not be ill, that I should be strong and work. I feel a little scared. When I get there, I know how to move. I don't touch any object in the high-risk area. I am very careful about how I work. When I am around a patient, I don’t touch them." Mr. Tarkulah graduated from high school recently and was looking for work before the Ebola outbreak. He disinfects the high-risk areas of the clinic, including the hallways, bathrooms and garbage. When someone dies, he sprays the body before it goes to the morgue.